FreeCarbonOffsets.com was created with you in mind. We take the conservation steps so you don't have to. After obtaining your certificate of Carbon Offsets from us, you can proudly display it for all to see, to show others that you care about our environment. You can continue on in your daily life worry and guilt free. The photos used on this site are in the public domain, or available under the GNU Free Documentation License. 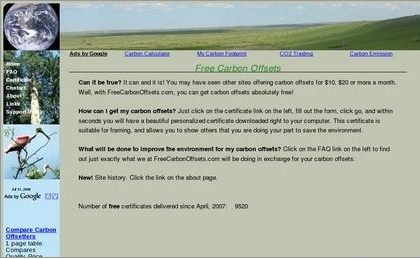 The "Dale explains carbon offsets" snippet is from the October 5th, 2008 airing of the "Earthy Girls are Easy" episode of the FOX series "King of the Hill". The "Homer and Lisa exchange thoughts on global warming" snippet is from the December 13th, 2009 airing of the "Oh Brother, Where Bart Thou?" (#MABF01 / SI-2101) episode of the FOX series "The Simpsons". Regarding copyright, see de minimis and fair use. May 15, 2009: Added geolocation information pages. October 3, 2008: Added Keep on Truckin' and Elegant certificate styles. October 2, 2008: Added News page. December 26, 2007: Traditional certificate introduced. April 24, 2007: Site Launch. A history of the certificate delivery count can be seen here. Geolocation information for the certificates created can be seen here. The scarcest resource is not oil, metals, clean air, capital, labour, or technology. It is our willingness to listen to each other and learn from each other and to seek the truth rather than seek to be right.